Asian design and plants have always excited me. 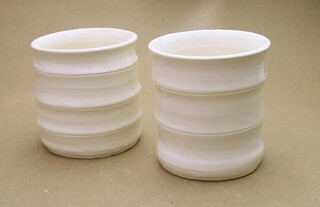 I made these tumblers to resemble the ridges, or knuckles, of bamboo. I use them for coffee. They feel good in my hands- I don't even miss the handles, especially in winter when the heat from the coffee or tea warms them.